Sailing the Bahamas is the quintessential Carribean escape. Explore tiny cayes, hidden bays, coves, and harbors on some of the over 700 islands in the Bahamas. In Nassau, we embark our sailboat, the Liberty Clipper, which never has a fixed itinerary, letting the Captain to chart a course for the best wind, weather & adventures. Travelers will normally explore the Exumas, an archipelago of 365 cayes and islands dotting the Caribbean Sea. 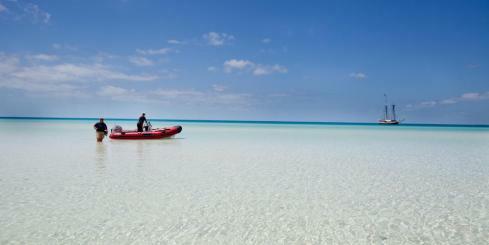 Eleuthera, one of the Bahamas' 'Outer Islands', is 110 miles long and just a few miles wide. Explore all the Bahamas on a small ship Caribbean sailing cruise with Adventure Life. Contact one of our Bahamas sailboat cruise specialist for any questions you have about cruising the Caribbean.